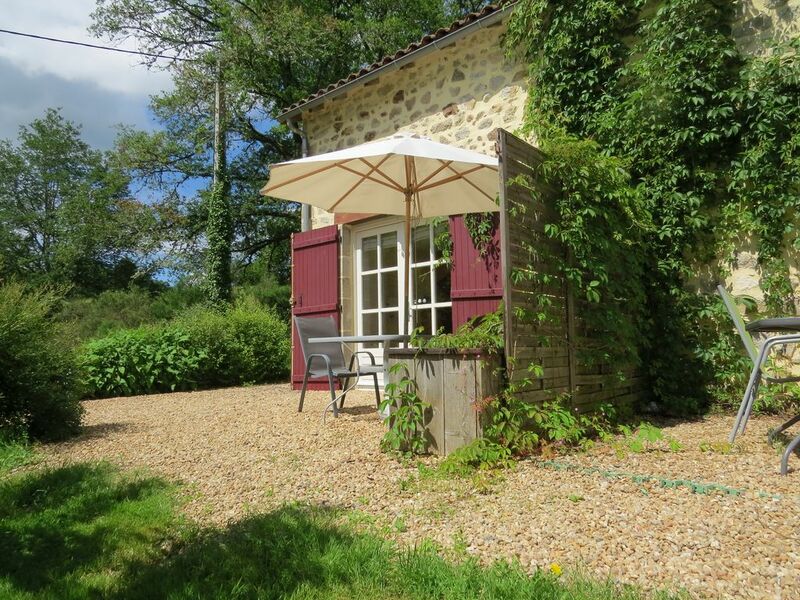 A charming rural gite for up to 2 people, 20 acres of grounds, wifi, by a river. A well-equipped gite in a stunning location. Bouleau is one of the gites available at Le Moulin de Pensol. Sleeping two, it sits at the end of a large converted stone barn. The bright and airy upstairs consists of a large double bed room with modern en-suite wet room. The ground floor living area comprises an open plan Kitchen/ diner and sitting room area with both UK and French TV available via satellite as well as a DVD player. This opens up via large glass double doors onto your private terrace area which leads out into the well-tended formal garden with seating and lovely grounds in which to stroll and enjoy the gentle chuckle of the river Bandiat. The 20 acres of mixed meadow and wood surrounding the mill are open for our guests to enjoy. Le Moulin de Pensol is run by husband and wife, Heidi and Nik Smith, together with Nik's brother Guy. The moved to the mill in February 2018 from Norfolk, England, and were delighted with the positive response they got to their first season. Heidi used to work in Nature Conservation in the UK and all three have been astounded by the abundance of nature they have seen since moving to France. Nik and Guy left jobs that they found unfulfilling to try and find a life that was more active and rewarding. With 20 acres and 5 properties to manage, plus a new language to learn - they have certainly achieved that! The Smiths have 5 dogs between them and dogs are very welcome at Le Moulin de Pensol. It's the location that make Le Moulin de Pensol special. When you open you door in the morning you will hear nothing but birdsong and the tinkle of the River Bandiat, which is only a few metres away. Miles of walking, cycling and running tracks lie right on your doorstep. This makes for a perfect holiday because while the energetic members of the family can pursue their interests, everyone else can relax by the pool, have a game of pentanque or sit on the main bridge and watch fish in the river. There is lots to see and do in the area however. Limousin is famous for its food and drink as well as the countryside, and many pretty villages and interesting market towns wait to be explored. And just because you are in the heart of nature, doesn't mean you have to compromise on accommodation. Comfortable beds, new, spotless shower-rooms with powerful hot showers and kitchens equipped for those who like to cook, are available in all Le Moulin gites. The pretty, little River Bandiat flows through the middle of the site, between the main house and the gite building. It is crossed by one of the three bridges. There is not a washing in the gite, but you can use the one in the main house for a small fee. There is not a tumble drier in the gite, but you can use the one in the main house for a small fee, or clothes lines are available. Towels for use inside, and separate towels for use by the pool are provided free of charge. Equipped for people who love to cook. A well equipped kitchenette with table and living area. Kitchen and dining area combined. Both British and French television is available. Your gite has a small stereo with a lead so you can hook it up to your phone. Badminton, boules (petanque) and other outdoor games are available. A large DVD library is available in the main house. The garden area, with relaxed seating is available for use by guests. We also have a further 20 acres of woods and fields to explore. We are very sorry but the bedroom and en suite bathroom are upstairs. There is a small , above ground pool which is shared between the 3 gites. Stroll through the bustling market at Piegut-Pluviers - the largest in the Dorgogne. Go and visit the amazing caves at Villars and stop off at the gorgeous village of St Jean de Cole on the way home. Walk from your gite through woods and across streams without seeing a single road and enjoy a meal at the Ferme du Lac. Their wines are very good and the walk home tends to take a bit longer! Or just stay on site and soak up the French sunshine enjoying the birdsong and seeing how many butterfly species you can spot.